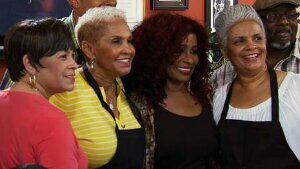 On this Saturday’s episode of “Welcome to Sweetie Pie’s,” Miss Robbie Montgomery welcomes the legendary Chaka Khan to the Upper Crust Restaurant to celebrate the singer’s 60th birthday. Khan stops by the St. Louis-based eatery for some cake and friendly fellowship, as the Upper Crust staff welcomes her with a soulful “Happy Birthday” song. Is 50 Cent Headed To Jail Over Illegal Stock Tweet? ?